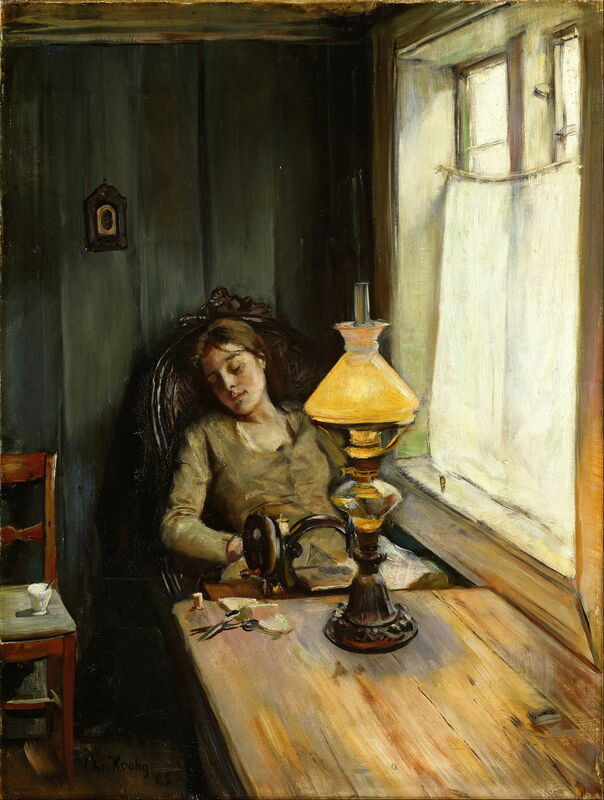 Christian Krohg (1852–1925), Tired (1885), oil on canvas, 79.5 x 61.5 cm, Nasjonalgalleriet, Oslo, Norway. Wikimedia Commons. The first functional sewing machines started to appear in the middle of the nineteenth century, and by 1870, several factories were making them for sale to anyone with sufficient money. Sales rose, costs fell, and by the 1880s they were within the reach of many households and individuals. They did not completely replace sewing by hand, though. Their best use is for making whole new garments and sewn items: an early comparison claimed that a fully hand-sewn shirt took over 14 hours to make, something a skilled machinist could complete within an hour. 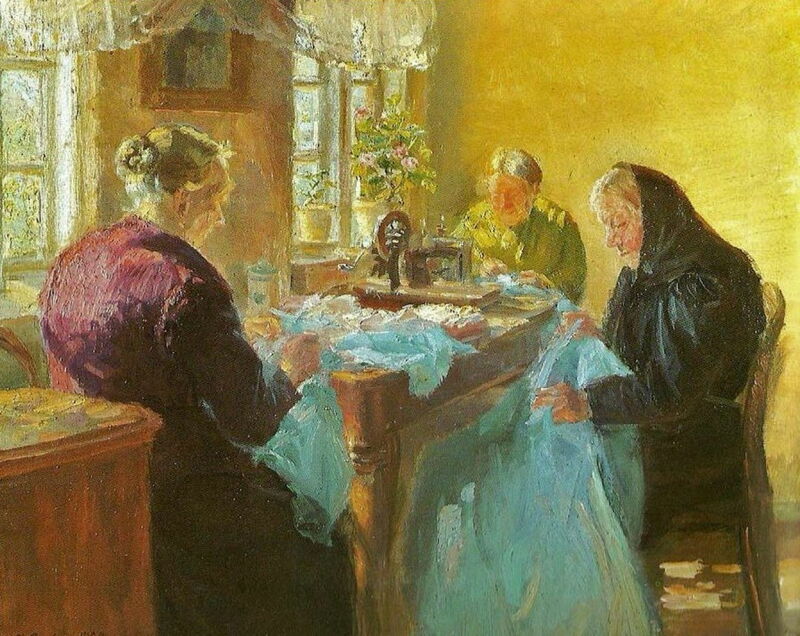 Otto Piltz (1846–1910), Sewing Hour, or A Sewing Lesson (date not known), oil on panel, 39 × 50 cm, location not known. Wikimedia Commons. 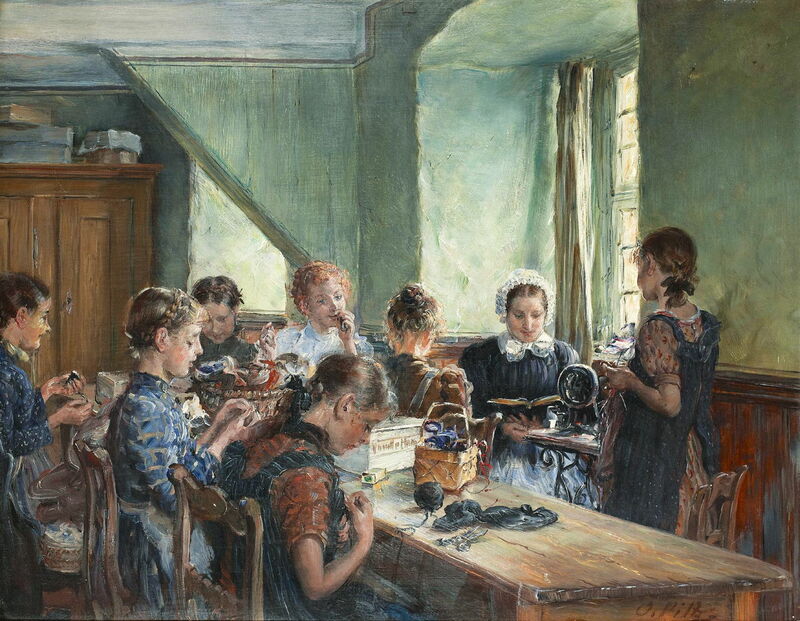 Otto Piltz’s undated Sewing Hour, or A Sewing Lesson shows a group of young girls (not one boy in sight) learning a range of fibrecrafts under the supervision of a teacher or nanny, who sits reading beside an early sewing machine. It is interesting that neither the children nor their supervisor appears in the slightest interested in the sewing machine. Piltz had originally been a decorative painter, and made many illustrations for the German family newspaper Die Gartenlaube, although here his style is thoroughly painterly and not conventionally illustrative. Wenzel Tornøe (1844–1907), Seamstress, Whit Sunday Morning (1882), oil on canvas, 40 x 36 cm, Randers Kunstmuseum, Randers, Denmark. Wikimedia Commons. Given the dramatic reduction in time to make garments, among the most enthusiastic early adopters were professional seamstresses, who could reduce cost and increase throughput once they had become adept with their machines. 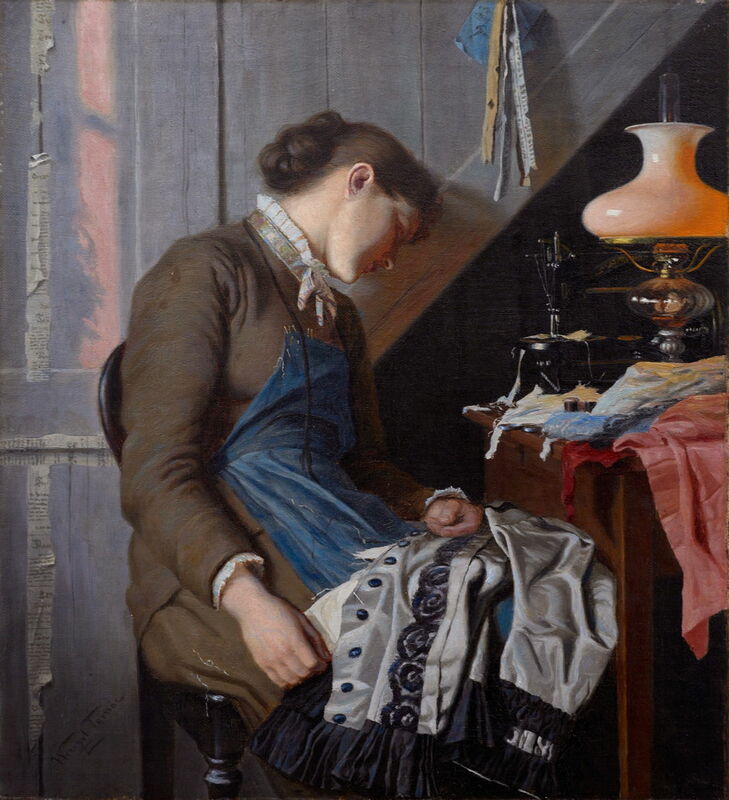 Wenzel Tornøe, a Danish genre painter, shows the effects of this in his Seamstress, Whit Sunday Morning of 1882, his best-known work. This seamstress had been engaged in making costumes to be worn for the Danish festivities of Pentecost (Whitsun), when many Danes rise early to go out and see the sun dance at dawn. By the time that the festival morning has arrived, she has fallen asleep over her work, exhausted. The Norwegian Naturalist Christian Krohg may have been inspired by that painting for his Tired in 1885. This was part of his longer-term exploration of the theme of fatigue and sleep, particularly among mothers. The young woman seen here is no mother, but a seamstress, one of the many thousands who worked at home at that time, toiling for long hours by lamplight for a pittance. At the left is an empty cup, which had probably contained the coffee she drank to try to stay awake at her work. 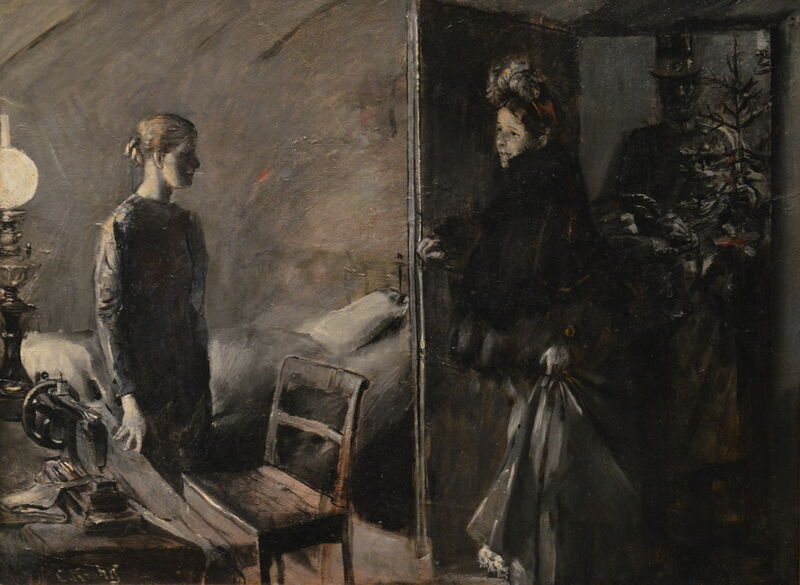 Home work as a seamstress was seen at this time as the beginning of the descent into prostitution – a major theme in Krohg’s work. The paltry income generated by sewing quickly proved insufficient, and women sought alternatives, which all too often led to prostitution. 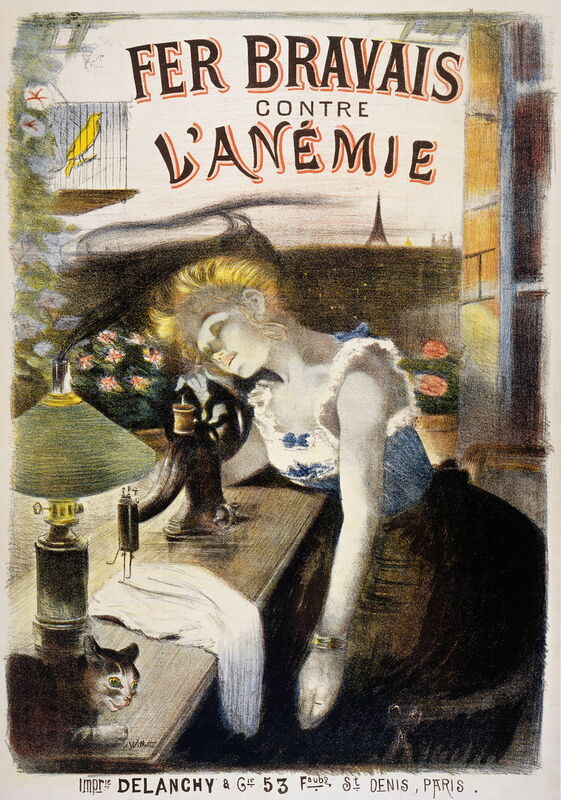 During the 1880s, therefore, in some countries in Europe, the sewing machine was seen as a precursor to a woman’s moral downfall, the top of the slippery slope. Moritz Stifter (1857–1905), The New Dress (1889), oil on panel, 30.5 x 40 cm, location not known. Wikimedia Commons. Other depictions were quite the opposite. 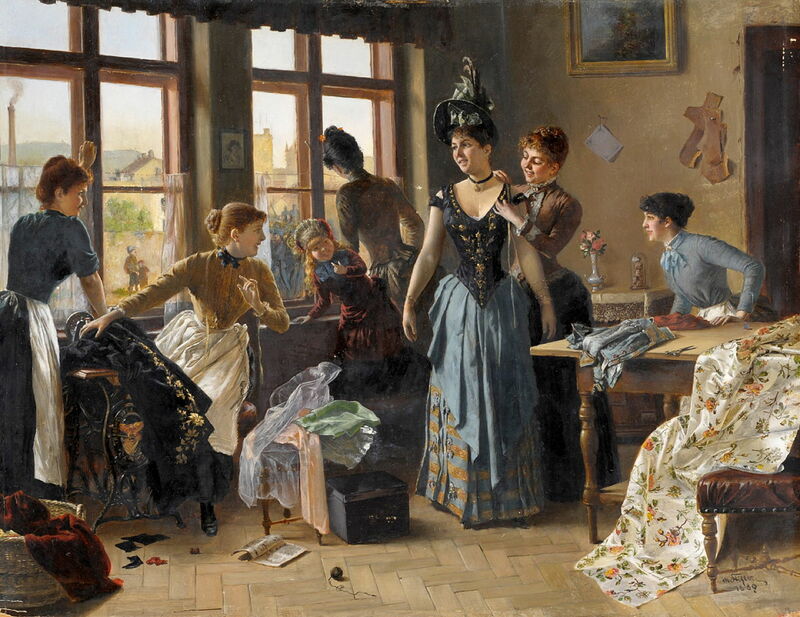 The Austrian genre painter Moritz Stifter’s The New Dress from 1889 places the sewing machine in the safe almost wholly-female setting of the dressmaker’s. Every face is smiling here, some perhaps a little vacuously, as an affluent young woman tries on a new dress, with its incredibly small waist. Although this room is full of fabric and the trappings of dressmaking, including the mandatory sewing machine, no one is actually making anything. Anna Ancher (1859–1935), Fisherman’s Wife Sewing (1890), oil on canvas, 59 x 48 cm, Randers Art Museum, Denmark. Wikimedia Commons. 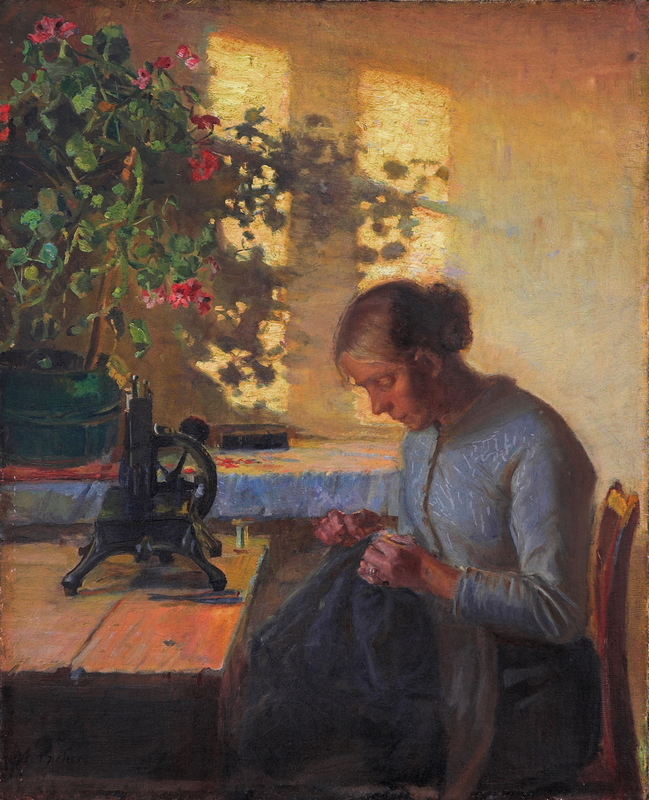 Fisherman’s Wife Sewing (1890) is another of Anna Ancher’s beautifully sidelit paintings, showing a further safe and moral environment for the sewing machine: for the fisherman’s wife, it could greatly reduce the time that she had to spend making, repairing, and maintaining her husband’s clothing. Adolphe Willette (1857-1926), Advertisement for Fer Bravais (c 1890), colour lithograph, dimensions not known, The Wellcome Collection, London. Courtesy of and © The Wellcome Collection, via Wikimedia Commons. The belief that there were many women left exhausted at their sewing machines persisted and pervaded. Adolphe Willette developed it further in this advertisement for Fer Bravais medicine against anaemia from about 1890. In a twist of irony, her cat appears very wakeful. The brand new Eiffel Tower in the background ensures that we recognise the location of this woman’s flat. Robert Koehler (1850–1917), The Old Sewing Machine (date not known), oil on canvas, 100.3 × 75.6 cm, location not known. Wikimedia Commons. There were other problems with sewing machines too: being mechanical, they could go wrong and need repair. 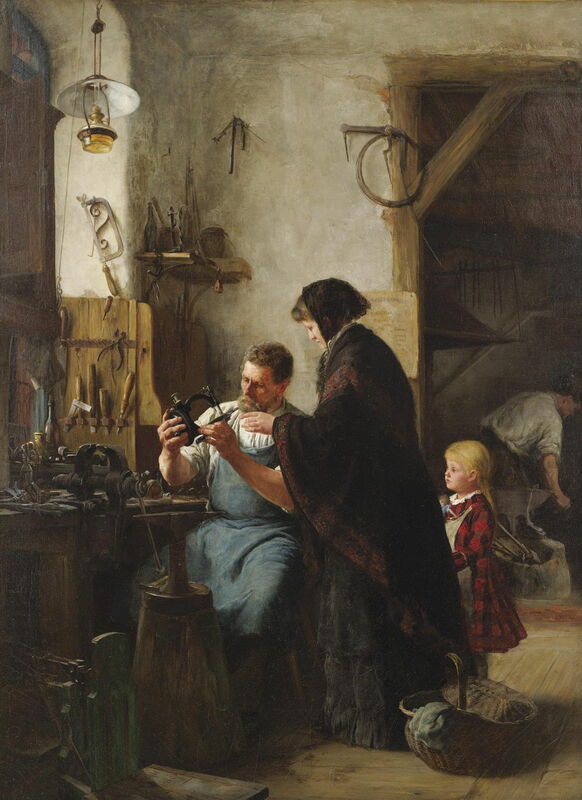 Robert Koehler’s undated The Old Sewing Machine shows a woman and her young daughter with a mechanic and repairman, looking at the woman’s old and very primitive sewing machine. Koehler is now little-known, but had a fascinating career. Born in Germany, he arrived in the USA in 1871, and decided to stay. He returned to Europe twice to train, and became a good friend of the American painters William Merritt Chase and Frank Duveneck, whom he met when they too were training in Munich. Ephraim Moses Lilien (1874-1925), illustration for ‘Lieder des Ghetto’ by Morris Rosenfeld (1903), further details not known. Wikimedia Commons. Women were not the only ones at risk of becoming slaves to their sewing machines. Many men worked as tailors and dressmakers, a trade prominent in the Jewish ghettos of Europe. Ephraim Moses Lilien’s Art Nouveau illustration for Lieder des Ghetto (Songs of the Ghetto) makes its point clearly. Lilien was a prolific illustrator who became the first Zionist artist. Adolphe Willette (1857-1926), Alone at Last (c 1915), illustration in ‘Journey of a French infantryman’, December 25 and 26 1915, Library of Congress, Washington, DC. Wikimedia Commons. 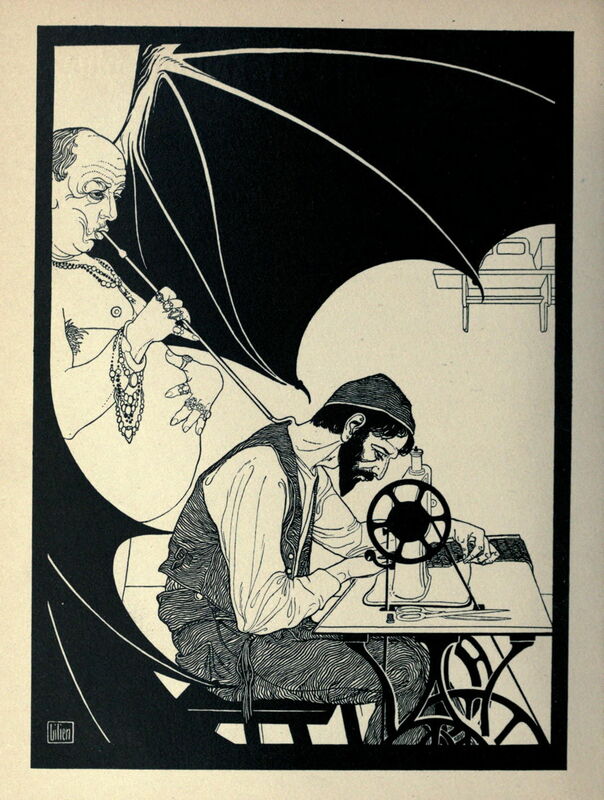 After his earlier illustration warning of the dangers of the sewing machine, Adolphe Willette struck a different balance in Alone at Last in about 1915. This illustration was used in Journey of a French infantryman, published at Christmas 1915, when many troops would have just returned home for seasonal leave from the First World War. While her husband has been away at the front, the young wife has been making good use of her time with her sewing machine. She looks a picture of health for all that work, too, but may well attribute that to the Fer Bravais, of course. 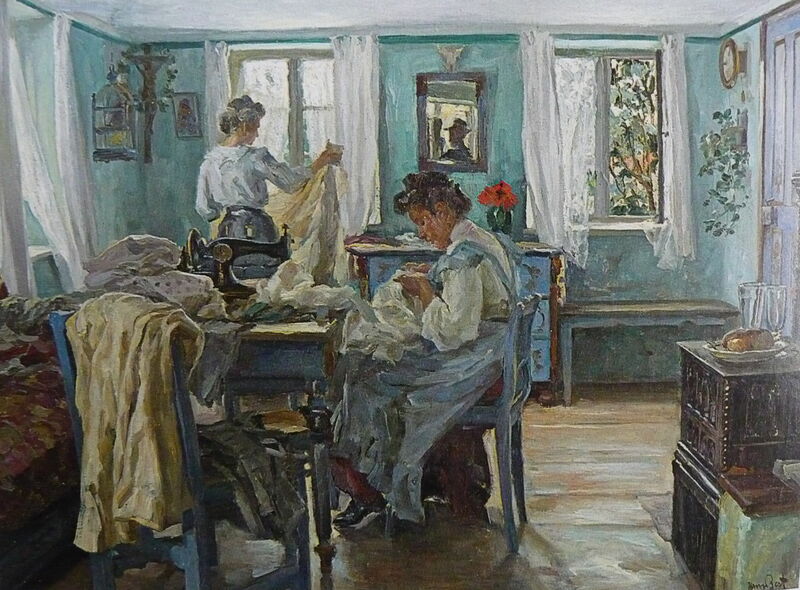 Hans Best (1874–1942), Sewing Women in the Room (date not known), oil on canvas, 54 × 73.5 cm, location not known. Wikimedia Commons. Judging by the sheer volume of garments in Hans Best’s undated Sewing Women in the Room, these two women are not just maintaining the clothes of their family, but are seamstresses working at home, sharing the single sewing machine. This effect is exaggerated by the multiple curtains at each of the windows. Izsák Perlmutter (1866–1932), Rákospalota Seamstress (date not known), oil on cardboard, dimensions not known, Magyar Zsidó Múzeum és Levéltár, Budapest, Hungary. Wikimedia Commons. 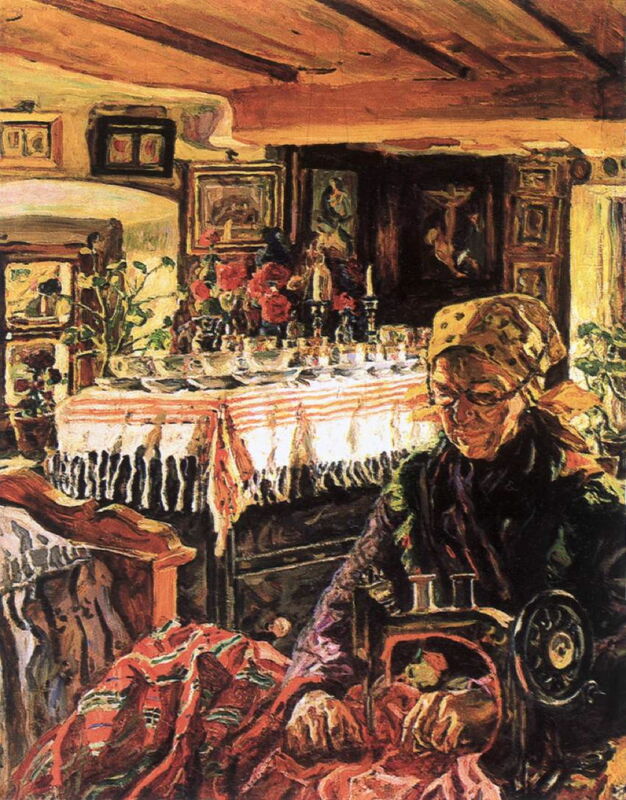 Izsák Perlmutter’s Rákospalota Seamstress (date not known) shows a Hungarian version of the same, a homeworking seamstress. Anna Ancher (1859–1935), Sewing a Dress for a Costume Party (1920), further details not known. Wikimedia Commons. Anna Ancher again makes the most of the light in her Sewing a Dress for a Costume Party of 1920. These three women look rather older than the average seamstress, and they are working with the materials for a single dress, destined perhaps for a daughter or granddaughter. One of them performs the larger-scale sewing at the machine, and the others progress the manual work. Christian Krohg (1852–1925), Seamstress’s Christmas Eve (1921), oil on canvas, dimensions not known, Nordnorsk Kunstmuseum, Tromsø, Norway. Wikimedia Commons. 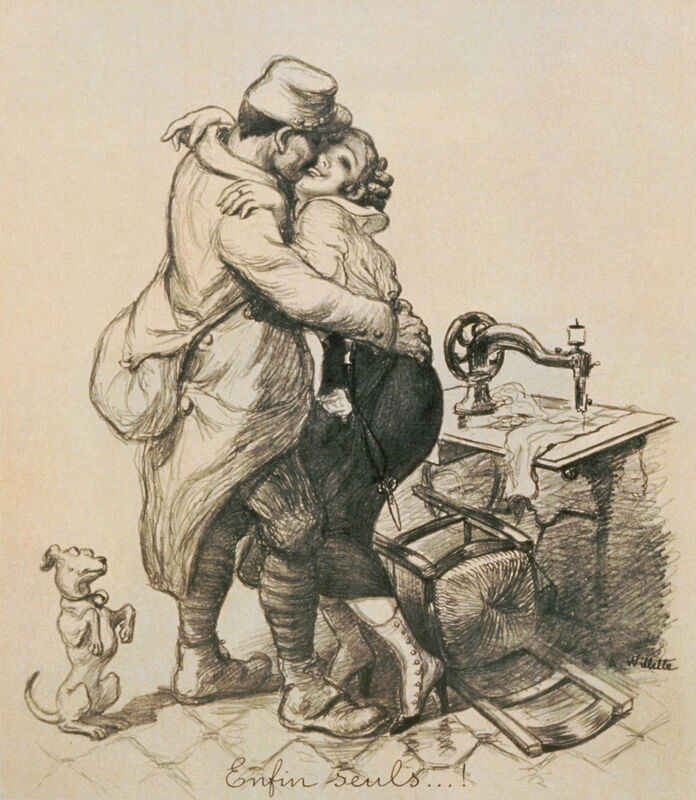 Christian Krohg returned late in his life to his earlier concerns over sewing machines and moral decline, in his Seamstress’s Christmas Eve (1921). A young woman is in her garret bed-sit, where she has been toiling long hours at her sewing machine. An affluent couple – a relative or employer perhaps – has just arrived to give the young woman a Christmas tree, a large wicker basket of presents, and more. Maybe that young woman can still be saved from the fate brought on by the sewing machine. 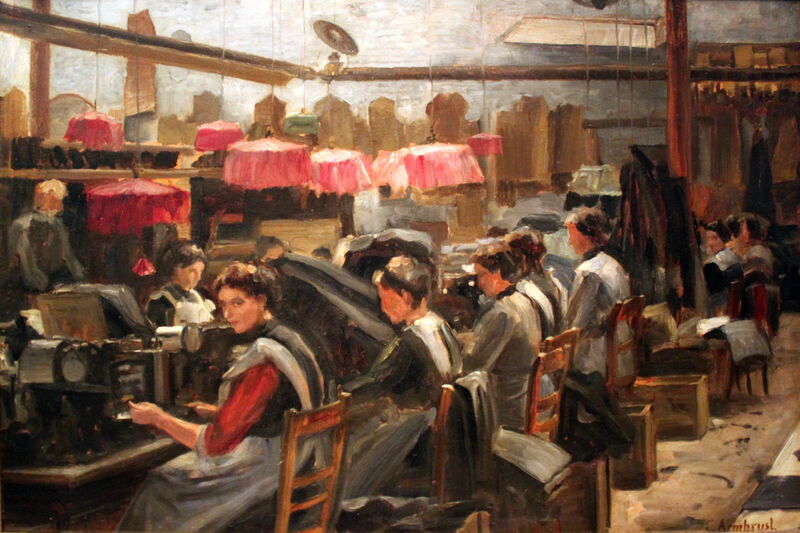 Karl Armbrust (1867-1928), Interior of a Sewing Mill with Seamstresses at Work (1927), media and dimensions not known, Deutsches Historisches Museum Berlin, Berlin, Germany. Wikimedia Commons. Sewing machines also had dramatic impact on the making of clothing on a more industrial scale. When sewing by hand, homeworking is the order of the day, and there is no value in pooling those workers into a factory. Once those seamstresses are working with sewing machines, the situation is reversed, and many were employed in factories, the sewing mills. Karl Armbrust’s Interior of a Sewing Mill with Seamstresses at Work from 1927 shows what was commonplace in garment manufacture. These women didn’t need the skills of those sewing by hand, consequently were paid a pittance. Paintings of the late nineteenth and early twentieth centuries explore many of the concerns and benefits of the sewing machine. One area which they left for the next generation of artists was the changing roles of women over this period – something which was directly influenced by the sewing machine. Sparing many women the time required to make and maintain the clothing for members of their household didn’t give many of them more free time. Instead, it enabled them to go and work in factories, to earn the money to pay for factory-made clothing and its repair. What at first had seemed to be an increase in independence ended up as increasing dependence. Posted in General, Life, Painting, Technology and tagged Ancher, Armbrust, Best, Koehler, Krohg, Lilien, painting, Perlmutter, Piltz, Stifter, Tornøe, Willette. Bookmark the permalink.